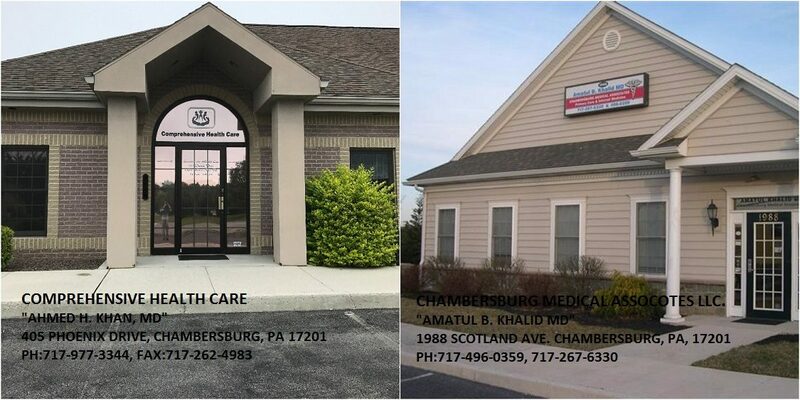 At Chambersburg Medical Associates & Comprehensive Health Care , we feel that you deserve the best in quality health care, no matter who you are. We gurantee to give each and every one of our patients the respect and attention they deserve. Dr. Amatul B. Khalid has been Board Certified in Internal Medicine for over 12 years. She is specialized in Hospice/Palliative care. She earned the respect of all her patients at the Central New Jersey Jewish Home for the Aged, where she worked before relocating to the Chambersburg Area. She has been featured in various medical journals and her expert opinion is valued by many other doctors. Dr. Khalid’s ideology in practicing medicine is, “Put yourself in the patients shoes – imagine you are going through what they are going through.” The detailed attention she gives to each and every patient is a proof on its own that she really cares. Dr. Khalid truly embodies what the Health Care industry should be. YOU CAN CALL AT FOLLOWING NUMBERS FOR BOOKING! !